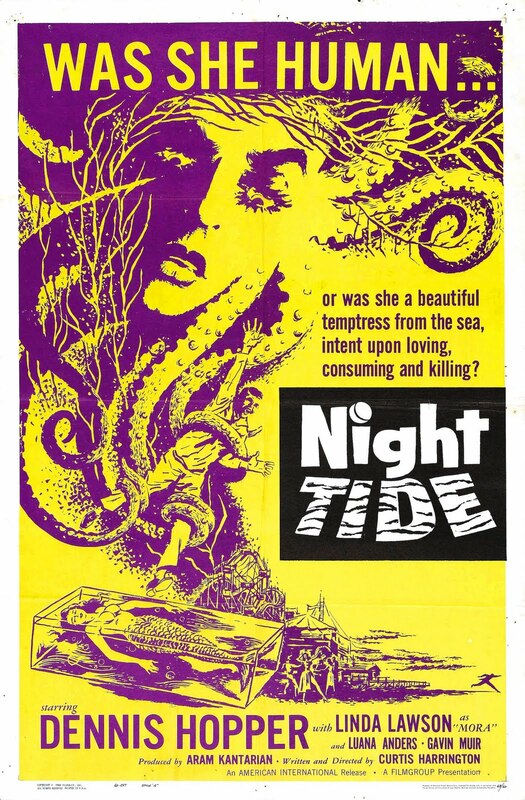 Cinema Sunday: Night Tide (1961) | Magazines and Monsters! This week brings another great flick from back in the day! Some don’t care for black and white, but as long as the acting and story are good, it doesn’t bother me at all. Of course, most of the best sci-fi films came from a time when color was in its infancy, but the monsters were still scary, the tech was really cool (for its time), and the ladies looked gorgeous! Speaking of gorgeous ladies, this week’s film has one for sure, in Linda Lawson! The film also has one of the most diverse actors, in Dennis Hopper! This guy has had many roles throughout his career, but always gives a solid performance. 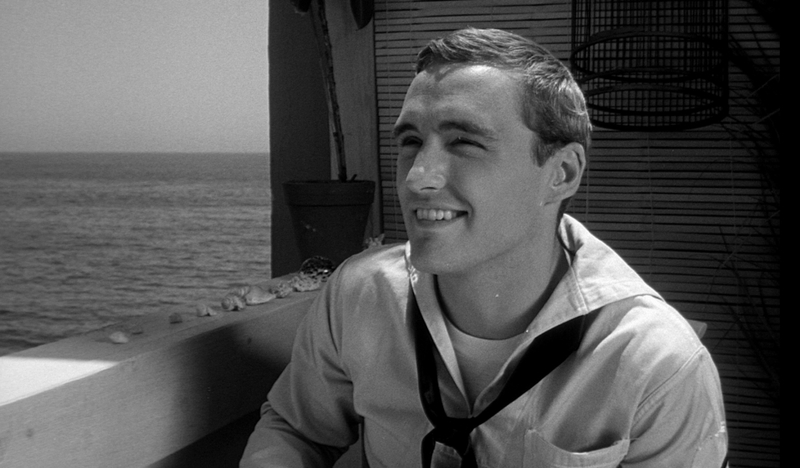 The film begins with a sailor, Johnny Drake (Dennis Hopper), making his way across the boardwalk in Santa Monica. He eventually wanders in to a Jazz Club, and sits down to enjoy the music and have a smoke. Within a minute or two, he notices a beautiful, black-haired girl, sitting by herself on the other side of the club. He makes his way over and asks if he can sit down by her. 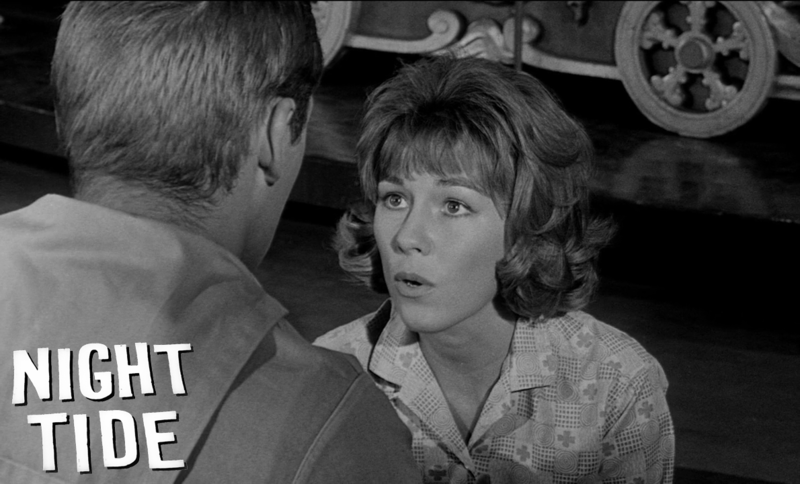 The girl’s name is Mora (Linda Lawson), and she seems to be a little apprehensive about talking to Johnny. As Johnny is trying to get his foot in the door, a strange woman walks behind him and mumbles something to Mora. It really upsets her, so she drops some cash on the table, asks Johnny to pay her bill, and runs out of the club. Johnny runs after her, an catches up with her outside. He offers to walk her home and listen to her to make her feel better after the incident. They reach her apartment, and Johnny makes a weak attempt to get her to let him come inside, but she’s not having any of that. He asks if he can see her again, and she concedes, and invites him to breakfast the next morning. The following day shows Johnny walking to Mora’s apartment. As he gets to the building, he helps an older guy lift up one of the windows to the carousel (Mora’s apartment is above the carousel ride on the boardwalk). 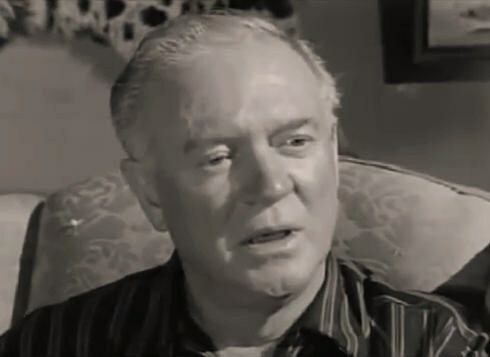 The man (Tom Dillon), thanks Johnny and then asks him a few questions about his relationship with Mora (nothing personal, just vague questions). Johnny seems a little nervous talking about her, so then he heads upstairs. Mora greets him, and the two have a nice meal together. She remarks about how she loves the sea and everything about it. You get the feeling that both have taken quite a liking to each other, but there’s definitely an ominous tone over the relationship. Mora then takes Johnny to see her place of work. She works at a side-show attraction where she portrays a mermaid in a tank of water. They find the side-show owner, Captain Sam Murdock (Gavin Muir – image below), asleep behind the counter. He seems like a nice enough guy, and then he tells Mora it’s time to get ready for the show. Sam then tells Johnny that if wants to know more about Mora, he should stop by his home, and he’ll tell him what he knows. Apparently he’s been her guardian since he found her on an island, years before when she was a youth. Another day brings another date, as the two young love birds spend the day at the beach. They talk a lot about themselves, and are beginning to get closer to each other. As night falls, there’s a beach party, and one of the musicians asks Mora to dance. She begins to a native-type dance (which is kind of ludicrous). As Mora dances, she spots that same woman from the Jazz Club earlier in the week, and she suddenly faints. It appears as if she’s going to be OK, and Johnny seems concerned. The next day, Johnny is having some coffee with the people who run the carousel, and talk about everyday subjects. 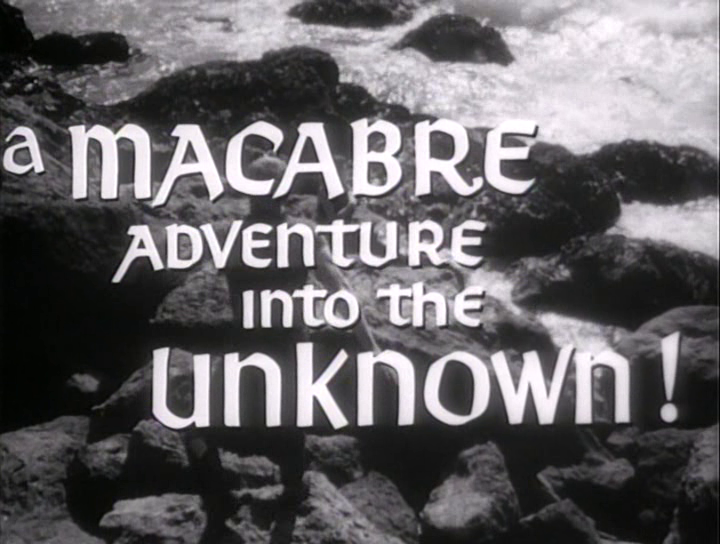 A policeman enters, and asks the man and his daughter, Ellen (Luana Sanders), if they’ve seen anything new. They tell him they haven’t seen anything, and he leaves a minute later. Johnny asks what’s going on, and they tell him that both of Mora’s last two boyfriends died under mysterious circumstances. Johnny seems shocked and can’t believe that Mora had anything to do with it. A local fortune-teller is also there, and she tells him that Mora was never implicated with either death. She also tells him to come and see hm for a reading. 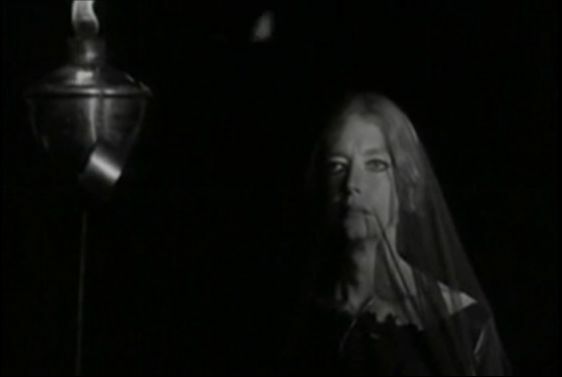 Suddenly, Johnny looks out the window, and sees the mysterious woman in black that’s been plaguing Mora. He follows her but loses track of her in a certain neighborhood. He then recognizes the address on the one house, and knocks. Captain Murdoch answers, and invites Johnny in for a chat. He tells Johnny that as long as he sees Mora, he’s in grave danger. Johnny doesn’t understand what’s going on, and then Murdoch tells him about the legend of the Sirens. After a short talk, Murdoch passes out from the booze he’d been drinking. Johnny takes the liberty of searching through Mora’s old room, but doesn’t find much of anything. He then confronts Mora about it, and she doesn’t deny it, and tells Johnny that the woman in black is one of them, and that she’s there to remind Mora that one day they will come for her! Will Johnny be able to stop the Sirens from taking Mora away, or will he end up like the last two men that fell under the Sirens spell! I had heard of this movie on a podcast, but not as the subject of their review, but just some idle chatter. I looked it up and thought the description sounded pretty cool. After watching it twice, I definitely knew I wanted to present it here for the masses. Hopper delivers a fine performance, even at this young age, and plays the part of the unaware lover. Linda Lawson is great as the mysterious girlfriend, as well. Another fine job was turned in by Luana Sanders (image below), as Ellen. She does a fine job as the third part of the love triangle (sort of), and is very convincing with her feelings toward Hopper’s character. The music score for the film was up and down, so it’s probably a wash on the scorecard. The sets however, were very good, and the setting of Santa Monica was a superb backdrop for the film. The cinematography was on point, and especially in two specific scenes (a dream sequence, and in another scene under the pier). of course, the film itself was very dark, and sketchy at times, so there is a desperate need for a restoration on this one. Definitely catch this one when you get time (check out the big video sites), and give it a watch. You’ll be impressed by Hopper and Lawson, and the quirky plot! Looks excellent. Will have to seek this one out. 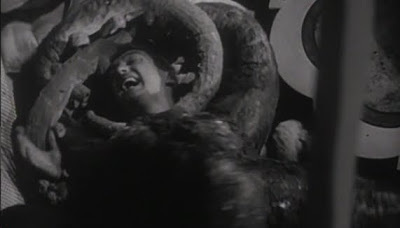 Pingback: Cinema Sunday: The She-Creature (1956) | Magazines and Monsters!